Mobile Wallet Market Growth « Global Market Insights, Inc. The worldwide mobile wallet market has positioned itself to be an extremely lucrative consumer-driven vertical, propelled by the attractive discount & cashback offers facilitated by service providers. Indeed, mobile wallet providers across the world have been impressively successful in attracting and retaining customers, growing their respective user-base at an exponential rate in the process, by simply offering their consumers frequent & appealing cashback offers and discounts. The entire cycle of discounts and cashbacks has proven to be extremely beneficial for both customers, who can obtain a plethora of products & services at a reduced rate, and mobile wallet service providers, who are able to be the recipients of profitable business from their patrons. While these frequent cashback offers may seem to be counterproductive for the growth of the mobile wallet industry, it actually reduces the cost of customer acquisitions by allowing companies to lower the amount they spend on marketing their respective products & services to the customers. Across the Asia Pacific, where the penetration of smartphones is supposedly the highest, consistent efforts taken by the regional governments towards realizing the goal of being cashless have benefited the mobile wallet market in a profound manner. The dense concentration of smartphone users and the government efforts toward establishing a cashless economy is so extensive that in 2017, APAC was known to have captured a sizable proportion of the global mobile wallet industry share. According to a report by Disruptive Asia, the most common denominator behind the market’s unprecedented growth in APAC is the sheer penetration the smartphone industry in the region is witnessing. Mobile wallet service providers have been able to capitalize on this lucrative opportunity by developing cost-effective & ubiquitous smartphone application-based as well as online solutions for customers across the region. In fact, according to a 2018 report by Merchant Machine, Asia’s home-grown mobile payment platforms, WeChat Pay & Alipay were able to effectively grow their user base to 600 million & 400 million respectively, significantly outperforming industry veteran PayPal which had over 210 million users that year. While the region’s mobile payments market is being led by the countries such as South Korea, Japan, Singapore, Australia and China, the country with the largest mobile wallet user base is China, with more than 45% of the nation having used this payment service in 2018 for their daily transactions. Augmented by the extensive popularity of this payment method, APAC mobile wallet market is set to depict an unprecedented growth rate over 2018-2024. The mobile banking sector in Europe has been evolving at a commendable pace over the previous five years. This trend could be attributed to the increasing prominence of a plethora of international as well as domestic entities competing with each other through their mobile wallet services in an attempt to capture a profitable chunk of the global industry. Moreover, the collaborative efforts of the region’s technology-oriented enterprises and the banking establishments have also been acknowledged as a factor that is responsible for expediting the Europe mobile wallet market growth. Meanwhile, the European Commission has been working diligently to develop an integrated & efficient payment services market across the European Union. The EU has adopted a new payment services directive in January 2018 to make internet payment services safer & easier to use and also to promote innovative internet & mobile payment services that would prove extremely beneficial for the Europe mobile wallet industry. Owing to these conducive factors, the Europe mobile wallet market is slated to grow at an impressive CAGR of more than 15% over 2018-2024. These regional trends quite clearly indicate that the global mobile wallet market is anticipated to attract numerous investors in the upcoming years. 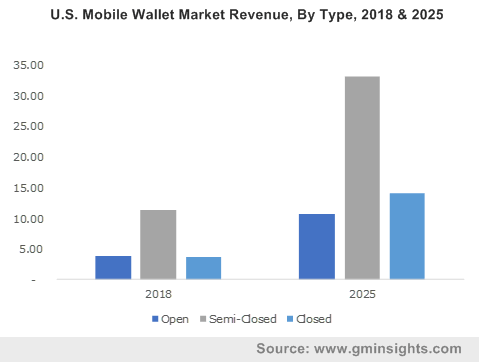 In fact, a research report from Global Market Insights, Inc., projects that the overall mobile wallet market size will be surpassing the renumeration mark of $250 billion by 2024. This entry was posted in Sustainable & Smart Technologies and tagged Banks, Closed, Device, Digital Only, Global Mobile Wallet Market, Mobile Wallet Market, Mobile Wallet Market Analysis, Mobile Wallet Market Forecast, Mobile Wallet Market Growth, Mobile Wallet Market Opportunities, Mobile Wallet Market Share, Mobile Wallet Market Size, Near Field Communication, NFC, Open, Optical, QR Code, Semi-closed, Tech Companies, Telco’s, Text-Based.